Quite simply, SeaWorld Orlando’s newest roller coaster is an elegant ride. Like the shark it is named after, Mako is sleek, sophisticated and fast. But above all, it is simply elegant. It’s not a word used to describe coasters often, but it fits. The ride is thrilling, but the cars gracefully maneuver the flowing track in a way that is repeatedly “re-rideable” and, well, elegant. The process to get to Mako’s opening day (the first new capital investment to open in the Orlando region in 2016) began years ago with SeaWorld Parks & Entertainment’s VP of Theme Park Development, Mike Denninger and VP of Theme Park Experience Design Brian Morrow. According to Denninger, the idea started with the desire for a dynamic ride to follow up on 2013’s Antarctica: Empire of the Penguin attraction. From there they determined a coaster was appropriate and, more specifically, that a hypercoaster would be ideal. It was then that they made the connection to sharks and using sharks’ strength and agility to inspire the coaster design. Mako is the company’s ninth collaboration with Swiss coaster design firm Bolliger & Mabillard (B&M). In addition to other projects, the two companies worked together in 1999 to create the first hypercoaster: Apollo’s Chariot at Busch Gardens Williamsburg. Denninger explained that the components of the hypercoaster are still the same, but have been enhanced for Mako. Parabolic hills provide the extensive amount of negative G’s or “air time.” Overbanked turns provide a feeling similar to cresting a wave. And the aptly named Hammerhead turnaround provides a zippy midpoint to what is essentially an out-and-back coaster. For their part, B&M have improved the ride technology as well over the 17 years since Apollo’s Chariot. Powerful design systems and computers allow for precise design and create a smoother ride. Magnetic brakes are used on the ride course, making for less jarring stops. The actual coaster is only one component of the whole experience. As guests enter the queue they really are starting a journey to becoming a Mako shark. As they move towards the station they go “underwater” as they approach a pier and a shipwreck beneath it. The station is themed to be a giant shipwreck, and an LED screen above the track shows shadowy figures of fish and sharks swimming overhead. When the operator dispatches a train, music plays and the overhead screen turns purple (in Morrow’s world, sharks see purple when they attack) and sharks speed forward, just as the train pulls out of the station. The music continues through speakers mounted to the lift hill until the only sounds heard are screams and rushing wind. Morrow wanted to make sure the experience extended to those not on the ride as well. As a train approaches the final loop around the queue entrance area, the park background music shifts into four different musical tracks written to emulate sharks coming after their prey. Guests can go on their own hunt when trying to find the 45 hidden sharks scattered among the themed structures and props surrounding the ride. Metal sculptures simulate waves around an aluminum welded ship coated with epoxy and themed to look like it’s been sitting at the bottom of the ocean for decades. The inclusion of the audiovisual equipment in the station and surrounding the ride entrance area is indicative of just how pervasive media has become in every theme park experience. For a long time, roller coasters were isolated steel structures separated from the more media-based attractions. While hybrids have existed in varying forms for some time, Mako really showcases how AV integration can further a storyline of what most would consider a thrill ride. 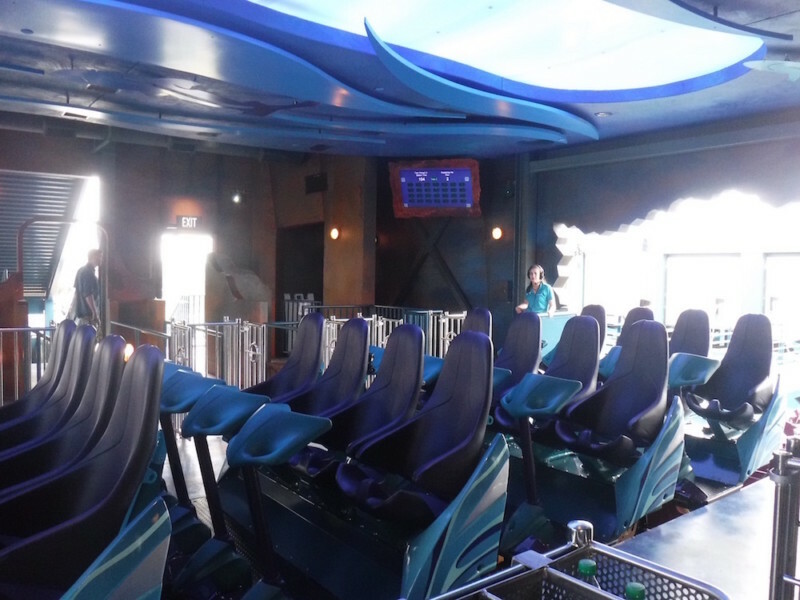 See InPark’s 2015 feature about the internal/external team process in developing Mako for SeaWorld and Cobra’s Curse for Busch Gardens Tampa.